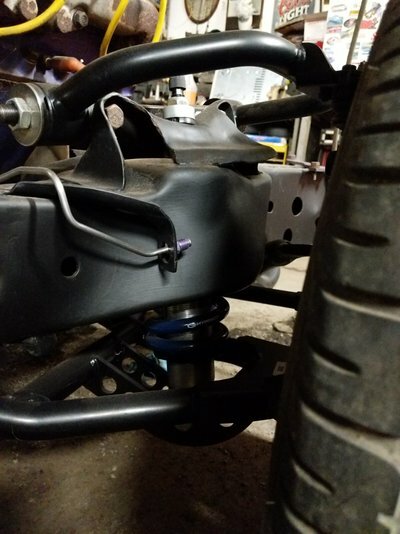 Full RideTech coilover suspension with tubular a arms and HQ adjustable shocks. And my new 18x9.5" wheels with 275/35/18 rubber for all four corners of the car. I have not tried them on the front yet, but others have run the same exact wheel and had no issues so i dont expect any. What I'm currently working on.... Couple engine upgrades while I don't have to lean over the fender to do it. Yes, my engine is purple. Ive had Chevy orange, just doesnt fit the g body IMO, had corporate blue (yuck), black, and even fire engine red. Wanted something different... These are Vortec heads I scored for free. Had to take the whole engine which had a broken rod. Cleaned the heads, swapped to LS6 springs and Comp retainers and we're ready to go! The progress is looking good, me likes the coilover setup! I might splurge for that one day, but I've got bigger fish to fry trying to get my current drivetrain and assembly together.